When she lost her soul mate, Caleb, Eve felt like her world had ended. Trapped in the palace, forced to play the part of the happy, patriotic princess of The New America—and the blushing bride of her father's top adviser—Eve's whole life is a lie. The only thing that keeps her going is Caleb's memory, and the revolution he started. Now, Eve is taking over where Caleb left off. With the help of Moss, an undercover subversive in the King's court, she plots to take down The New America, beginning with the capital, the City of Sand. Will Eve be able to bring about a new, free world when she's called upon to perform the ultimate act of rebellion—killing her father? 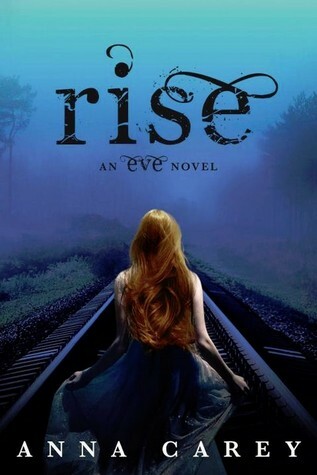 In Rise, Eve must choose who to leave behind, who to save, and who to fight as Anna Carey's epic tale of romance and sacrifice in the chilling dystopia of The New America comes to a stunning conclusion. Anna Carey graduated from New York University and has an MFA in fiction from Brooklyn College. She lives in Los Angeles. Caleb is shot in Eve's arms at the end of Once and they are quickly separated. The feeling of hate for her father are now intensified to a death wish for him and with the help of rebels' leader Moss, she intends to act on it. Her marriage to Charles is a sham and even still, the both like and respect each other. With Eve's brutal honesty to Clara about Charles, the two begin to forge a relationship based on trust that for both is hard won. The revolutionaries are also working to end her father's rule as well. It is amazing to see how far Eve has developed since I first met her. You can see just how much she is like her father with a will and strength that she decides to use for society rather than her own gain. Eve struggles with the knowledge that she might have cost many lives when she is force to give away one of the rebels' tunnels into the city, but Moss doesn't let her dwell on that fact and encourages her to continue fighting against her father, even committing the ultimate sacrifice and assassinating him. Eve discovers she is pregnant with Caleb's baby and Charles gallantly takes responsibility. When the attempt fails and more of her rebel friends are lost in the fight, she escapes with Clara and some of the school girls that have been recently brought into the capitol. Wow, there is so much excitement and action in the conclusion to this trilogy. I love how Eve has grown and fights for others. In her dystopian world, death is a daily occurrence and just surviving another day is miraculous. Clara also develops into a whole character here as well and I found I really liked her. I did not see this ending coming, not be a long shot. I was so happy it ended this way but I would still like get a bit more detail on the aftermath. Sorry, no clues there about the actual ending.